I put this on top of Barry M Black Grape. This is easy to use and easy to apply. Just sprinkle it over a wet nail and tap off the excess. Make sure you do one nail at a time so the polish or top coat doesn't dry! Make sure you have a bit of paper or a tub underneath to catch the excess. This is a pretty gold glitter, but nothing special. Looks nice enough though! Only swatched this. Gorgeous gold and love the name! Really pretty gold glitter! 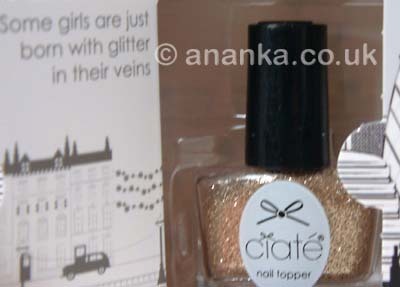 I don't think it's very good value though since you can buy loose glitter for really cheap from born pretty store etc. It's nice, but as usual I'd prefer it swimming in a clear nail polish (easier to use). Wow! This is a gorgeours glitter. Love the combination of colors!